Welcome to our 5-minute to diagnosing a faulty boiler air pressure switch. What is An Air Pressure Switch? Before going any further, it’s important to understand this is a job for a Gas Safe engineer. It is not safe (or legal) to open up a boiler and work on parts within the combustion chamber, without Gas Safe accreditation. You can get a qualified professional to come and help you here. Sick of your old and unreliable boiler? Use this 90-second clickable form over at BOXT to get a fixed price on screen. The air pressure switch in a boiler ensures that waste gases are being expelled, before allowing to fire up. The fan creates a draft which allows harmful gases to be released from the boiler via the flue. For your boiler to fire up, the pressure switch needs to have recognised that the fan is running first. Given there’s more than one part to the air pressure switch puzzle, it’s not simple to diagnose. 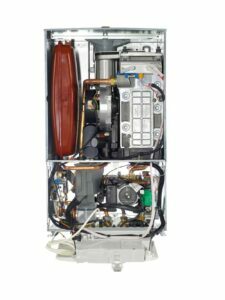 For instance, the air pressure switch might not be allowing the boiler to fire, but it could be just doing its job, rather than being faulty. On other occasions, it will get stuck open or closed. It’s important to understand that any air flow issue will cause a air pressure switch to not allow the boiler to fire. But, that doesn’t mean the switch itself is to blame. A typical example might be a boiler whereby the pilot light is “blown out” during high winds. It’s very rare for wind to actually blow out the pilot light. If it does, it’s more likely a fan issue, and most likely, a low (and incorrect) speed setting. The fan must expel flue gases. If it’s operating at a low speed, it won’t counteract the tiny back-draught in the flue. The air pressure switch notices the pressure differential isn’t great enough, and shuts off the boiler. This is a fan problem, not an air pressure switch problem. The switch itself might be in perfect working order. But, it’s an electrical component. If the wiring has degraded, or hasn’t been wired correctly, this will cause the pressure switch to develop problems, and potentially not work at all. Moisture can work its way into the electrical components, including the boiler’s pressure switch. New boilers have much better sealed electrical units than older ones. So, if you have an older boiler, there’s a chance condensation has worked its way into the switch or rubber hoses, and caused the fault. Anything that messes with air flow and pressure, will cause the switch to tell the boiler it’s not safe to fire up. That includes kinked and broken hoses. These are a few symptoms of a faulty air pressure switch in a boiler. However, similar symptoms can occur when other parts are faulty, so it’s important to run a diagnostic. Otherwise, you’ll be replacing expensive boiler parts, only to find the same problem still occurs. If the air pressure sensor has wiring issues, it’s likely its communication with the PCB will be intermittent. This will cause it to cycle on and off sporadically. If the fan is definitely running, in theory the air pressure switch should communicate with the PCB and fire up. But, that’s only the case if there isn’t another air flow issue. For instance, a working fan, but a blocked flue would cause the pressure switch to remain in the closed position. Some boiler manufacturers have specific fault codes for an air pressure switch failure. As an example, the Ariston E34 fault code signifies that the problem is the pressure sensor. Refer to your owner’s manual and find out if the code relates to an air fault. There’s no “set price” when it comes to the cost of replacing a boiler’s air pressure switch. The cost of replacement mentioned below is an estimate. Prices will differ for labour throughout the UK, and the specific boiler you have will determine the exact price of parts. Expect the air pressure sensor itself to cost £50. A complete unit with hoses can be up to £100. Expect labour to cost £75-150 depending on the part of the country you are in, and if you need a full unit fitted. The total cost of a replacement switch should be in the region of £175-250. Need help diagnosing and fixing your heating? Get help from a qualified engineer here. 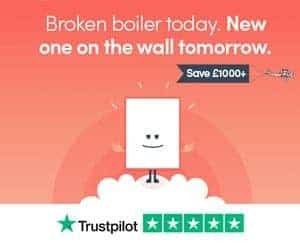 Prefer a replacement boiler? Get your price online in less than 90 seconds here. Thanks for reading our 5-minute guide to boiler air pressure switches.